Sometimes when we see celebrities, politicians, journalists and other popular figures with their verified twitter handles we just hope we were in that same position. The truth is you can also get your twitter handle verified especially if you are active on twitter. Twitter approve account types maintained by users in music, acting, fashion, government, politics, religion, journalism, media, sports, business, and other key interest areas. 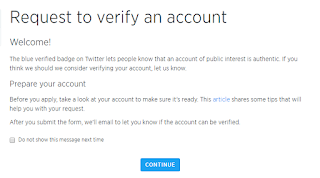 If you believe your account is of public interest and should be verified, this article outlines information about submitting a request for you to get verified. What does it mean to get a verified twitter handle? No one can impersonate you on twitter which happens to be one of the most popular social media platforms. That’s why you see almost all popular figures have their handles verified. The good news came July last year that you don’t have to wait to be verified by twitter because user who believe they have some good amount of influence needed to be verified. Let me also inform you that it is not certain twitter will get your handle verified once you file a request for verification. Note: This information will be displayed to the audience that you’ve chosen. There are visibility settings available for your birthday that allow you to separately control who on Twitter can see your birth year and who can see your birth day and month in your Twitter profile. · If the account belongs to a person, the name reflects the real or stage name of the person. · If the account is a corporation or company account, the name reflects the real name of the corporation or company. · The profile and/or header photo reflects the person, the corporation’s branding, or the company’s branding. · The bio specifies an area of expertise and/or a company mission. Visit verification request form web page and make sure you are logged into your Twitter account to proceed. If you are not logged in you will be asked to. Hit the "Submit" button Your request will be sent for review. Once a decision has been made, you will be notified via e-mail. 1. Learn how to Tweet effectively gives you a choice between 2 tweets and asks you to choose which one is better. It has the form of a quiz, but there will be no negative effects if you do not answer correctly. It is designed to teach you to increase your Twitter followers. 3. Protect your Account asks you to enter a phone number that Twitter can call if there are any problems with your account. 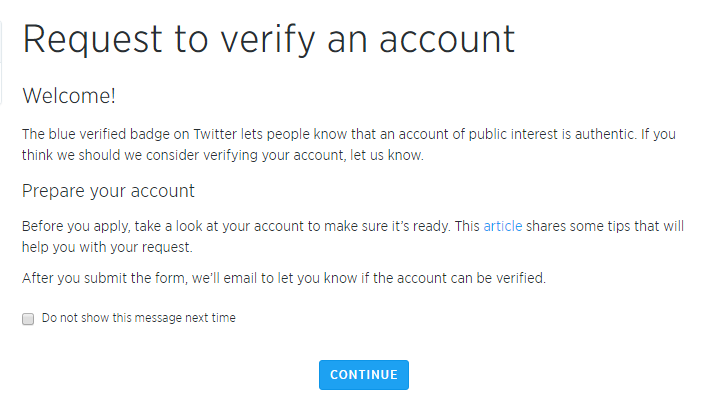 Once you have completed this step, your account will be verified.